The co-founder of the Charles Company, the developer behind the Melrose Triangle project in West Hollywood, has been arrested on federal bribery charges. According to a statement from the U.S. Department of Justice, Arman Gabaee, 57, known professionally as Arman Gabay, was arrested this morning at his home in Beverly Hills. Gabay has been charged with allegedly paying monthly bribes to a Los Angeles County employee for six years and offering to purchase the employee a Santa Rosa home for nearly $1.1 million in exchange for getting the county to enter into a $45 million lease with the Charles Company. Gabay’s Melrose Triangle is a major project consisting of three buildings with a total of 300,000 square feet on a plot of land bounded by Santa Monica Boulevard, Melrose Avenue and Almont Drive at the city’s border with Beverly Hills. It will house offices, restaurants and shops and 76 residential units. In addition to the Melrose Triangle project, the Charles Company has proposed building a 19-story hotel topped with a helicopter landing pad at 9034 Sunset Blvd. next to the Marriott Edition. 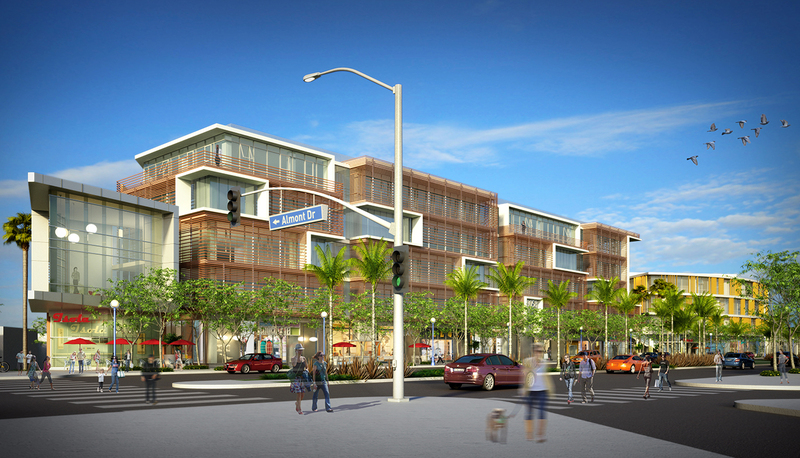 The Charles Company has submitted a plan for that project to the City of West Hollywood. The Charles Company is a partnership between Armand Gabay and his brother Mark Gabay. Gabay’s Excel Property Management has been a major donor in West Hollywood City Council election campaigns. For example, in 2015 Excel donated $10,000 to a so-called independent expenditure committee that backed the campaigns of councilmembers John D’Amico, John Heilman and Lindsey Horvath and challenger Joe Guadarrama. 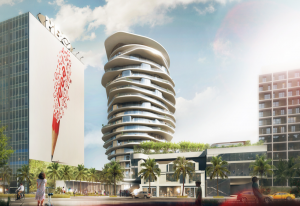 Illustration of the proposed 19-story hotel at 9304 Sunset Blvd. (R&A Architecture & Design). The complaint alleges that Gabay paid the employee cash bribes of $1,000 or more every month for six years “in exchange for county leases, non-public information, and other benefits.” According to the complaint, Gabay paid the employee thousands of dollars during covertly recorded meetings in late 2016 and early 2017. In 2017, Gabay allegedly offered to purchase a Northern California residence for the county employee in exchange for the employee’s help in getting Los Angeles County to lease space in the Hawthorne Mall, which Gabay was redeveloping. According to the complaint, Gabay wanted the county to enter into a 10-year, $45 million lease to rent space in the Hawthorne Mall for the Department of Public Social Services and other county departments. The FBI’s investigation and intercepted communications described the steps Gabay took last year to buy a house for the county employee as a bribe to commit the county to the Hawthorne Mall lease. Gabay ultimately settled on a home on eight acres of land in Santa Rosa wine country that was listed for $1,095,000, the Justice Department said. Without ever seeing the property, Gabay allegedly told an associate to “make the offer” on the home “ASAP” as a bribe for the employee. Intercepted communications allegedly showed Gabay taking steps to try to disguise his ownership interest in the property, telling the associate that the offer on the property could not be in Gabay’s name and that he wanted to conceal his ownership interest in the property through some type of entity. In April 2017, Gabay allegedly placed two offers on the Santa Rosa residence, first for $1,035,000 and later for $1,065,000. According to the complaint, immediately after FBI agents approached Gabay and told him they were aware of the bribe arrangement, Gabay’s offer on the property was withdrawn within hours. If convicted of the bribery charge alleged in the complaint, Gabay would face a statutory maximum sentence of 10 years in federal prison. This case is being prosecuted by Assistant United States Attorneys Ruth C. Pinkel and Lindsey Greer Dotson of the Public Corruption and Civil Rights Section. BTW – However “zoning” played an issue, let’s not forget I believe Sept 2011 John Heilman Smiled and expressed great pleasure and a relief at how long it took for the City to CHANGE ZONING FOR THESE BIG DEVELOPMENTS as a not so clearly stated part/purpose of drafting the now infamous NEXT 25 YEAR PLAN FOR THE CITY. The plan was thrown together, leaving out all the efforts local residents put in believing it was a true & honest plan for the City’s Future, including committees of residents who didn’t get to submit any work because Heilman was rushing to get the “plan” filed, as a mandatory part of the difficult process of proving drastic changes, call for Zoning Changes. To paraphrase: Heilman stated it would be unfair for the city staff redraft the Plan to include the resident input, since it was already done, and redoing it (to be truthful & accurate) was unfair to the paid City Employees whoes job is to do just this type of work. Clarifying our zoning laws in the City will go a long way in reducing the need to grease the wheels of the system. Tons of regulations, ordinances, at times confusing or contradicting legislations, are making developers go through a torturous trip. No wonder some developers attempt a shortcut. The old adage still holds true for the majority of our Councilmembers (but not all) — WeHo has the BEST City Council money can buy! I swear, after Mr Duran’s mayoralty story was posted and our fearless editor posted his editorial, I was thinking about corruption in our small little town. If politics in this town is to be clean, we need to hire a special council to investigate the degree to which developers have corrupted our city. While it defies all common and public sense for why so much of this city needs to be chewed up for the sake of developer profits, we need to ascertain whether city hall is in any involved. And hold judgment until such a report is delivered. Our city could be clean. We need to know. They, the developers own two properties right on the block where I live. They have been vacant for years in hopes of tying them into the proposed hotel that is pictured in this article. I rather enjoy the peace of not having neighbors close by but they, the vacant properties, are rather ugly to look at. I would hope that the city would force them to at least demolish them. There are two properties for sale on the south side of Harrat St that look right at these dumps. One has been on the market since last September or October, I forget, and the other since last winter. I can see prospective buyers looking at the For Sale properties but then they look at the dumps on the north side and, so far no takers. Of course, the For Sale properties are priced in the neighborhood of 3 Million Dollars. I suspect that a certain Mayor elect may be a bit sleepless given that the FBI has been monitoring Mr. Gabay’s telephonic communications. The last thing City Hall needs is the FBI focusing on WeHo’s cozy relationships with developers, “independent expenditure” and “charitable” donations and the other ethical issues that have plagued the City for years. Not the last, but the first thing the city needs…….to purge this rot so it can move on. The sooner, the better. Hum…. Interesting quote. I’m trying to think if it would apply to anyone else, perhaps more prominent, on a national level? It took long enough to find the obvious, BUT I’LL TAKE IT. There is always something corruption in all levels of government. All are unacceptable, BUT there are gross illegal injustices that some BIG developers engage in regularly. Of course, they are only HALF THE PROBLEM. The City/County Officials (Elected or Just employed by the City/County) didn’t choose to accept the Illegal Bribes with a gun pointed at their head. Both are equally criminally responsible for whatever projects that are found to be illegally Bribing for Project Approval. We don’t know many details, and I am strongly against which hunts. However the numerous WeHo City Approved Mixed-Use Mega projects can not all be free of some kind of “pay to play” approval. Our City is not yet HALF DESTROYED AND REPLACED BY THE NEW MEGA PROJECTS …. YET. I hope there is uncontraverted evidence for any such illegal bribing that may have gone on in WeHo. I WILL WAIT TO GIVE MY PERSONAL JUDGEMNT AND OPINION UNTIL THERE IS ANY ILLEGAL ACTIVITY PROVEN IN WEST HOLLYWOOD, AND WHO WAS INVOLVED AND WHO WASN’T. This type of non-prejudgement is the normal civilized and fair way to deal with potential issues. I point this out since over the past years, the City has made statements/implications and covered by WeHoVille for all types OF PENDING ALLEGATIONS of people not in the good favor of the City. I am not going to respond with a rush to judgement before anything is known and formally charged. One bad actor making snarky judgments during a trial does not mean we should respond in kind and do snarky judgment-esque statements and point fingers at specific people by name, BEFORE anything has been found AND released to the public. I am not looking or hoping for revenge or incarceration if adjudicated. I JUST WANT THIS INSANE OVER BUILDING AND THE CITY SPENDING … as my grandfather said … Spending money like MATZO-VASSER. The tip of the jceberg! The Gabay bothers gave $10,000 to two of our Alhambra councilmen,Jeff Maloney and David Mejia,during the elections, . The Gabay/Charles Company was developing a Lowes in Alhambra . The Alhambra city council voted unanimously to approve the project despite public testimony showing violations of CEQA environmental laws. A local environmental group sued the city and the Gabay brothers and stopped the development. Former mayor, Mark Paulson, was the consultant who worked with the city to push the development through without an Environmental Impact Report. In SHUT EYE, the interesting series that was canceled by HULU, the lead charactertells the antogonist they should become Developers because that is the one business that appears to be legit when its not. From the Townscape Three to this new guy busted by the Feds. How much did this white straight male give to Mayor John Grindr Duran? Race? How about his being straight? What does this mean for the development of the Melrose Triangle project that was about to begin construction???!!! I hope this doesn’t delay the project even further. Council members taking money from Developers (or anyone) and then voting in their favor are crooks too.